The Bharatiya Gorkha Janjati Sangarsha Mahasangh (BGJSM), an affiliate of the Gorkha Janmukti Morcha, today organised a rally starting from the Lower Motor-stand to Chowrasta with the demand for granting tribal status to 11 communities, 10 from the hills and one from the Dooars. The BGJSM demanded for a blanked grant of tribal status to the 11 communities instead of giving special favours to individual communities. It criticised the state government for granting special provisions to communities like the Lepchas to divide the Gorkha community. The 11 communities comprise the Bhujel, Gurung, Mangar, Newar, Jogi, Khas, Rai, Sunwar, Thami, Yakha (Dewan) communities from the hills and Dhimal from the plains. 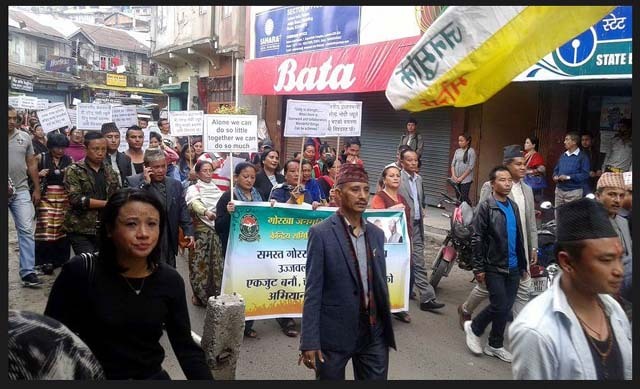 GJM leader Asha Gurung said they have not given up on the demand for a Gorkhaland state in place of tribal status, and that securing tribal status for the 11 communities would only bolster the fight for achieving a separate state.